According to the sources at TechCrunch, HP has dropped Windows 7 + Intel based hardware for its ambitious tablet project because “It’s too power hungry”. This news, which is yet to be confirmed by HP comes only a few hours after it was confirmed that Microsoft Courier Tablet wont see the light of day. If this turns out to be true, then it will leave a big hole for PC manufacturers and specially Microsoft to fill as Apple iPad will now continue to dominate this niche market without having any major competing device in this form factor. I have been saying this for month and will repeat my statement again. Microsoft needs a Tablet which is based on the new Windows Phone 7 OS (something on the lines of this concept). Because lets be honest, the current (client version) Windows 7 wasn’t initially designed to be a touch friendly mobile OS. It was designed with keyboard + mouse input devices in mind, just like how OS X has been. The sources at TechCrunch have also been told that HP Slate may debut again in late 2010, or sometime next year running Chrome OS or Android. HP may also bring WebOS to this market after they bought Palm only a few days ago. bummed! Really bummed if this is true. I guess in light of recent events it could mean Palm cloud OS on the HP slate? 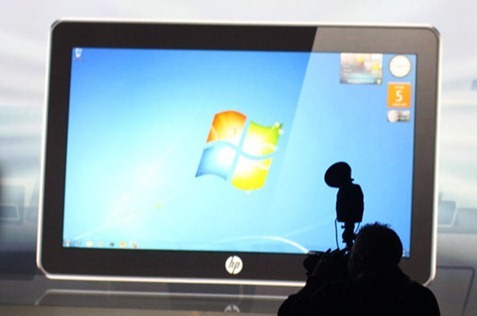 Hope not, I love HP and Win 7 really is the only OS I will accept on a tablet. iphone OS just wont cut it. HP's decision to dump Microsoft demonstrates that Microsoft has become completely uncompetitive in the portable devices market. Microsoft has wasted development years, and is now many years behind. I can't see Microsoft catching up any time soon. Windows Phone 7 is going to be uncompetitive when it is released. There are just too many problems with it, and it will take Microsoft at least 2 years to bring WP7 up to standard. This is time Microsoft does not have. While Microsoft will retain the dominant desktop OS, it has completely lost both the smartphone market and the slate market. It's now too late to catch up. Kind of a disappointment, I was seriously considering one. I spend alot of time in Doctor waiting rooms and sometimes my Macbook is a little bulky. Now Google should push hard their tabled prior to HP new Slate on Palms WebOS…. As for Win 7, it will stay on PC where it belongs…no mobile devices please! I would think this has to do with the fact that HP recently bought Palm. A WebOS based slate would probably be a lot better than a chrome os or android os slate. This is not necessarily true…. this is a RUMOR. And the sky is falling, disease is on the rise , end of the world is 2012! Listen to yourself, if everyone thought like you we wouldn't have technology in the first place, for once let MS take their time. And what do you mean “not up to standard”…as far as I'm concerned the standard is always evolving, as it stands WP7 is of particularly high quality. Windows 7 is made to scale, but even with the most agility, some software is meant for higher powered hardware. HP may be simply trying to use a suitable OS for the device. Win7 can't run on everything, shoving it onto the slate may hurt both the device and softwares performance.Don't use a 747 jet engine to move a row boat. Great post, really enjoyed this article, many thanks for posting this.